New Jersey Garage Door Installer And Repair Insurance. If you are thinking about starting up a garage door installation and repair business, there's no doubt that you have a lot on your mind. You want to make sure you choose the best name for your company, that you have a well-designed website, and that you employ the best professionals and have the highest quality products to ensure you deliver exceptional service. There's one thing that you might be overlooking, however: business insurance. Commercial insurance is vital for any business, including NJ garage door installation. It safeguards you, your employees, and your clients from any legal issues that may arise. There are a lot of options available for New Jersey garage door installer and repair insurance, so it's important to have a firm understanding of the policies you can get and what they offer. New Jersey garage door installer and repair insurance protects your company from lawsuits with rates as low as $37/mo. Get a fast quote and your certificate of insurance now. Do You Need NJ Garage Installation & Service Insurance? In order to protect the financial assets that are associated with your business in the event of an accident, a poor installation, or faulty equipment, New Jersey garage door installer and repair insurance is a requirement in order to own and operate this type of business. Premises Liability: It's likely that you have an office for your NJ garage door installation and repair business. If you do, you need to make sure that you are protected from any injuries that may occur on the premises. Commercial general liability insurance also offers coverage for premises liability. So, in the event that a client slips and falls at your office and sustains an injury, your insurance policy will cover the costs medical care, as well as any legal proceedings that may arise. NJ Business Auto Insurance - If you or your employees drive vehicles for your business, having a business auto insurance policy is a good idea. Should an car accident occur, this type of insurance will cover the damages the vehicle sustains, as well as bodily injuries and damaged equipment within the vehicle. Also most commercial auto policies also cover theft or vandalism. NJ Workers Compensation - If you have an non-owner employees on your payroll, you are likely going to be required to have workers comp. Each state differs regarding requirements for this type of insurance, but in general, it is meant to protect your company and your workers in the event someone is injured on the job. Accidents do happen while installing garage doors and your workers should be covered. Work with your agent to provide information about your business and get quotes for your NJ garage installer & repair insurance based on your specific situation and risk tolerance. 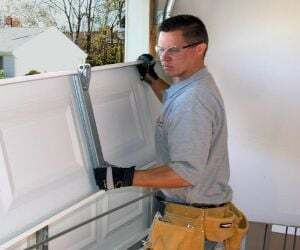 Request a free New Jersey Garage Door Installer And Repair insurance quote in Asbury Park, Atlantic, Bayonne, Beachwood, Bellmawr, Bergenfield, Bound Brook, Bridgeton, Camden, Carteret, Cliffside Park, Clifton, Collingswood, Dover, Dumont, East Orange, Eatontown, Edgewater, Elizabeth, Elmwood Park, Englewood, Fair Lawn, Fairview, Florham Park, Fort Lee, Franklin Lakes, Freehold, Garfield, Glassboro, Glen Rock, Gloucester, Guttenberg, Hackensack, Haddonfield, Hammonton, Harrison, Hasbrouck Heights, Hawthorne, Highland Park, Hillsdale, Hoboken, Hopatcong, Jersey, Keansburg, Kearny, Kinnelon, Lincoln Park, Linden, Lindenwold, Little Ferry, Lodi, Long Branch, Madison, Manville, Metuchen, Middlesex, Millville, Morristown, New Brunswick, New Milford, New Providence, Newark, North Arlington, North Plainfield, Oakland, Ocean, Palisades Park, Paramus, Passaic, Paterson, Perth Amboy, Phillipsburg, Pine Hill, Plainfield, Pleasantville, Point Pleasant, Pompton Lakes, Princeton, Rahway, Ramsey, Red Bank, Ridgefield Park, Ridgefield, Ridgewood, Ringwood, River Edge, Roselle Park, Roselle, Rutherford, Sayreville, Secaucus, Somers Point, Somerville, South Plainfield, South River, Summit, Tenafly, Tinton Falls, Totowa, Trenton, Union, Ventnor, Vineland, Wallington, Wanaque, West New York, Westfield, Westwood, Woodbury, Woodland Park and all other cities in NJ - The Garden State.